Students from the School of Law and Social Sciences and the School of Psychology and Education at the University of Suffolk have graduated on the Ipswich Waterfront including the first cohort of MSc Crime and Community Safety: Evidence Based Practice. 1,402 students will be conferred at ceremonies taking place this week. 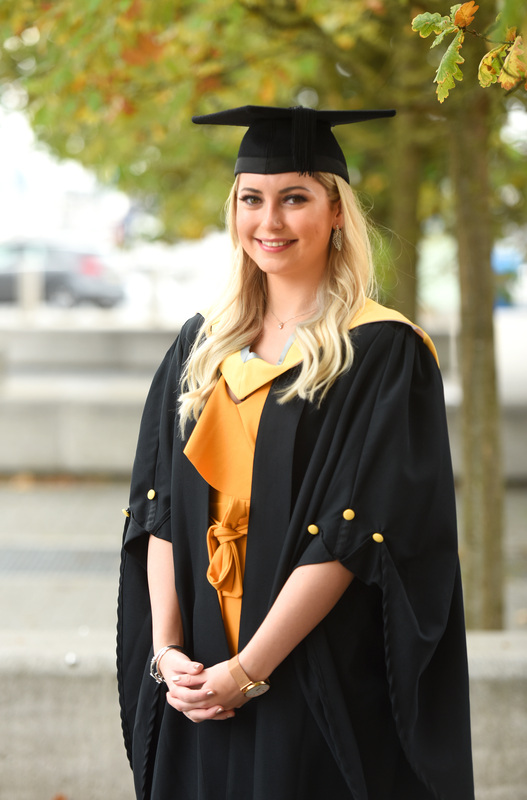 Amongst those graduating was the current Students’ Union President and Vice-President. In the afternoon students from the School of Psychology and Education graduated including Woodbridge based Alex Munns. Alex gradated with a BA (Hons) Special Educational Needs & Disability Studies and has set up a charity called Project 21 aimed at offering events, activities and clubs for people with Down’s Syndrome in Suffolk. Alex’s passion is to enhance the lives of people with Down’s Syndrome and to challenge the misconceptions of Down’s Syndrome in society. Honorary awards were presented to founder and CEO of Suffolk based coffee brand Paddy & Scott’s, Scott Russell, founder of the organisation Autism & ADHD, Annie Clements and founder of the animal charity Suffolk and Essex Small Animal Welfare (SESAW), Maggie Jackaman. Scott Russell became an honorary fellow of the University. Scott is a former EADT East Anglian Business Person of the Year and the driving force in making Paddy & Scott’s one of the UK’s top independent coffee brands. Scott is a proud member of Accelerate 250 (the UK’s top 250 companies geared for growth) after being championed by the Prime Ministers Enterprise Advisor, Lord Young, and ex Tesco CEO, Sir Terry Leahy. In 2016, Scott founded the Meru Farm and Ruiga School project in Kenya, a world first collaboration between the consumer and coffee grower driving sustainability and education, whilst breaking down trade barriers that encourages free trade amongst the whole coffee growing community. In 2017, Scott was named by Grant Thornton as one of the country’s top 100 influential business leaders joining the illustrious list of “Faces of a Vibrant Economy”. Annie Clements has over 30 years’ experience working with both young people and disability. She has worked in delivering face-to-face youth work and in creating and monitoring projects and organisations. She has vast experience of feeding into local and national policy and strategy and it is estimated Annie’s work has affected at least 10,000 families, with the possibility of many more considering the number of professionals she has trained across the UK & Europe. Autism & ADHD works very closely with the University on the Special Educational Needs and Disability Studies degree. The organisation delivers talks to the students and are part of the Board that looks at the course and employability. Maggie Jackaman was recognised for services to animal welfare and the community. Maggie founded Suffolk and Essex Small Animal Welfare (SESAW), a registered charity that cares for and re-homes injured and homeless animals. 400 animals are re-homed annually by SESAW. She has served 22 years as a Parish Councillor, ten of them as Chair and in 2016; she received a Babergh District Council Community Achievement Award. 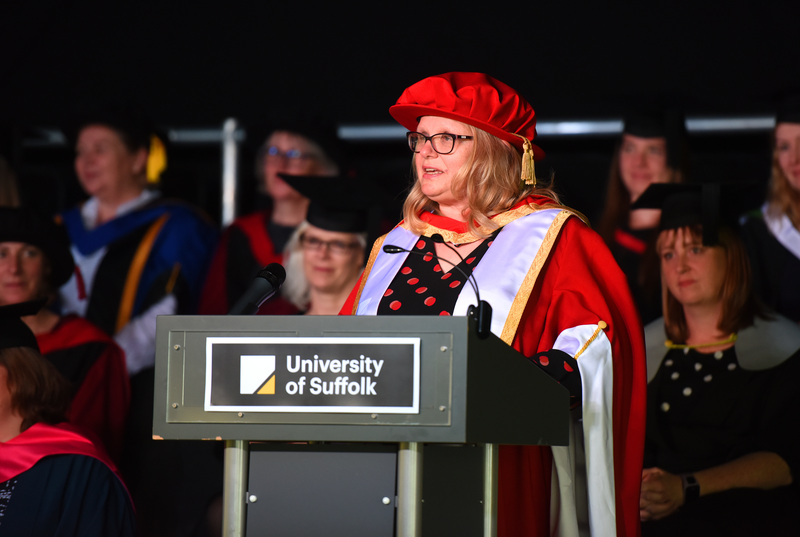 The final graduation ceremonies of 2018 will take place tomorrow, which will see students from the School of Health Sciences and the School of Science, Technology and Engineering graduate as well as students from the University of Suffolk at Suffolk New College.